Do you know how impactful your e-learning programs are? Measuring the success of e-learning programs doesn’t just serve as a validation of e-learning investments. Tangible performance results following the implementation of e-learning programs are crucial in aligning the corporate training goals, understanding the impact of the training on job performance and ultimately determining the direct return on investment (ROI) associated with them. Many metrics, or more often called key performance indicators (KPIs) are available to measure the effectiveness of e-learning programs – and while all businesses have have very different needs, there are four KPIs every business should use: Completion rates, approval and satisfaction of learners, learner performance and progress, and rating of instructors and managers. Most often completion rates are an indicator of the learners’ levels of engagement, motivation and participation. A low course and module completion rate suggests corporate learners are not well-invested in the e-learning program experience. It may also indicate that they do not have knowledge regarding its advantages and applications in real world. When the completion rates are high corporate learners are well-aware of what is at stake and therefore are ready to invest their time and efforts into the online learning program. Track completion rates to find out where your learners stand. If you notice a low completion rate, educate your learners on the importance of the given training and try mixing content types to include a variety of visual and audio files. Many providers of online training software offer the ability to use multimedia content to keep learners engaged and interested. Learners’ satisfaction is another crucial metric in tracking success of e-learning programs. A good e-learning program makes the trainees feel that the material they were given was valuable and truly assisted them in learning how to do their job more effectively. Learner satisfaction measurement can be obtained simply by implementing surveys when the learning programs end. Their responses will show how well they are satisfied with the program and hence how successful the program turned out to be. Encouraging feedback and open communication will also results in ample and specific responses. At both, the individual and group levels, learners’ performance and progress shows in detail how every corporate learner is progressing. For instance, whether they completed their online training specifications properly or how they had scored on a particular task assessment. In group overview, feature graphs and charts cover particular trends. For example, it is discovered that 55% of the corporate learners still require completing the monthly module of compliance. Both these learning metrics allow for tracking the efficiency of the e-learning program as well as learners’ engagement. Online managers, instructors and other members of the leadership team play a very important role in e-learning. They inspire and motivate corporate learners so that they can actively participate and lead their subordinates with example. The approval ratings also tend to give a vivid indication of how well they are fulfilling their role within the e-learning program. For instance, corporate learners might complain that the online instructor or teacher is not interacting or connecting on a regular basis. In response, better strategies can be applied to further improve the e-learning program. 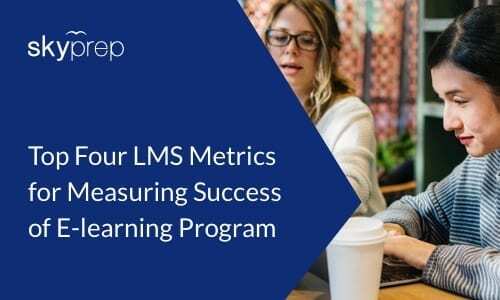 It may take time to put the required processes in place for measuring success through appropriate metrics for e-learning programs however proper metrics for measuring success of e-learning programs will lead to efficient learning. It is also important to note that training metrics are of no use if they cannot be properly measured. All metrics mentioned above can easily be measured either quantitatively or qualitatively.